Deixis is derived from the Greek word for reference or showing (the adjective is deictic, incidentally). It concerns the ability of language to identify objects, times, people or ideas with reference to something else. In other words, it refers to things which can only be understood in some kind of context. In simpler terms, deixis refers to the way we signal here or there, now or then and you or I.
I can only understand what here refers to by knowing where you are – here is a relative not absolute concept of space. The centre is here. We can only understand what him refers to by knowing who you are. The centre is I. We can only understand what tomorrow means by knowing when this is said. The centre is now. In the first sentence, here is an adverb (although some analyses will refer to it as a pro-form standing for this place) but deictic pointers can fall into various word classes. In the second example, the pointer is a pronoun and in the third example it is another adverb. This diagram may help a little. There is no shifting of the centre because go indicates movement away from here and soon is related to now. but, in English, that would be ambiguous because we don't know if the going to bit refers to a current intention or a movement away from here. This shifting of the centre accounts for a great deal of confusion with related verbs such as bring-fetch-take and come-go in English because other languages conceptualise spatial and temporal relationships differently. Japanese, for example, always uses the equivalents of come and go from the point of view of the speaker. German tends also to be speaker centred in this respect. Are you coming to the cinema with us? *Yes, I'm going. She's sitting next to you. The person who wrote this is illiterate; they can't even spell. we have no idea whether the group is male only, female only or mixed. Other languages distinguish, e.g., between plural females and plural males (such as French does with elles and ils) so it is clear who is being referred to. 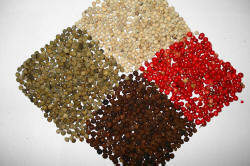 For a mixed group, the masculine plural is used in most languages which make this distinction. in which we promiscuously mix singular verb forms with plural pronoun forms. For more, see the guide to concord linked in the list of related guides at the end. In many European languages, too, there is a distinction between familiar and polite forms of the pronoun you and the distinction signals closeness and/or formality. This is called the T-V distinction after the French (or Latin) tu and vous forms. German, incidentally, also has a plural familiar form (ihr) which many other Italic languages in Europe lack. Many East- and South-Asian languages, such as Japanese, also have distinguishing honorifics (such as san) which make more complex and subtle social relationships clear. English is defective in this area, making no distinction in the pronoun between social closeness or distance or even the number of people addressed. It just uses you. *The team got off the bus and she ran into the stadium. *The group of friends met at 9 and then it went to the cinema. which is grammatically sound but almost impossible to a native-speaker's ear. which is fine in languages in which the pronoun is already marked for politeness but can cause offence in English if no politeness routine such as Please would, ... I wonder if you could ... etc. is used. The obvious ones are items such as tomorrow, yesterday, the day before, next year, then, now, afterwards, the following month, the week before last etc. They are usually adverbs or prepositional phrases acting as adverbials (although an alternative analysis is to call some of them nouns or noun phrases acting as adverbials.). Absolute dates are excluded from this category so expressions such as the 4th of March 1627 are not deictically related to now in the way that 10 years ago is because it can be understood whenever the sentence is spoken. The prepositional phrase 10 years ago can only be understood by knowing when the statement is made. which both refer to time not relative to another time. Deictically, these two utterances are related to now (where we are centred). For more, see the guides to tense and aspect linked in the list of related guides at the end. Some languages do not exhibit relative tense forms so the concepts in English will be obscure. Others may use absolute terms for concepts such as the previous year, the next day etc. 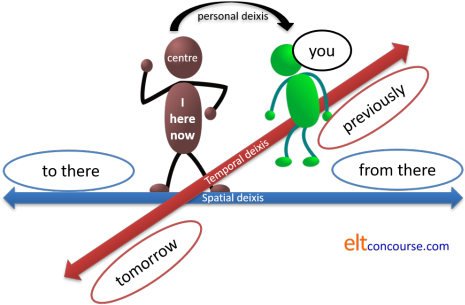 Spatial deixis is usually achieved by the use of prepositional phrases, demonstrative determiners or adverbs. If one assumes that the addresser is at home, it is clear that he/she is moving the centre of deixis to the addressee. From the speaker / writer's point of view, the blue gate is probably not on the left and this not that is where home is. The speaker has also moved the time centre to the future, i.e., the moment the person arrives at the lane and that may be months away. In this case, the addressee is not in the same place as the speaker and is near to or in the speaker's home. 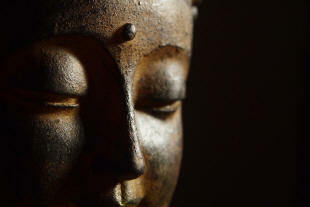 In effect, we are imagining speaking from where the listener is, not where we are. because there is no need to move the deictic centre. The verb simply indicates movement away from the current location. It bears repeating that languages differ in the use of simple verbs like this and it is a source of error. "I want to stay here," I replied. "Well stay there, then," she said and shut the window. The key to getting the joke lies in the visitor and landlady's different understandings of here and where the deictic centre should be. The first implies either that you are accompanying us / me or that it is my party in my home we are referring to. The second carries no such sense and may be referring to a party to which the speaker has not been invited. There is rich ground for covert error here. In other languages, the terms here and there are very differently interpreted and may depend, for example, on whether the place being referred to is at a higher or lower altitude or upstream or downstream from the speaker. We need to be slightly careful to distinguish here between anaphoric and cataphoric referencing and discourse deixis proper. When he got to it, he found the house was much as he had expected; the place was old and shabby. we have two cohesive devices. The pronoun, it, which stands for the house and refers forward in the text. That's cataphoric referencing. A general term, the place, which refers back and stands for the house. That's anaphoric referencing. Both references are to something in the text so they are both endophoric references. In this, the marker It refers to everything which follows, not to a particular item. That is discourse deixis. It needn't be a literary device, of course, although it often is. Simply responding to an anecdote with That's fascinating is an instance where one person's entire discourse is referred to with the term That. Equally, we can include in our own discourse something like ... and that's why ... or This is a good one ... and both of those are examples of discourse deixis; the first anaphoric and the second cataphoric. The marker this/these can refer anaphorically to a previous stretch of discourse and cataphorically to something to follow but the marker that/those can only refer anaphorically.